For the seventeenth day of our 31 Days of Pink Odyssey with essie cosmetics, we had some fun with tribal-inspired patterns. We created a slightly different design on each nail to give the look fun variety! Start off with a pink base (preferably on the lighter side). Then, choose two more complementing colors. We paired a baby-pink base with bright blue and coral. 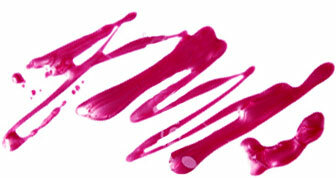 Once your base is dry, take a thin, sturdy paint brush and draw simple designs on each nail. We used lines, dots and zigzags. Have fun with it!